For some time now I have been mulling over a concept that involved a model and a lot of books. Fortunately each year Heretaunga Rotary Club hold an annual book fair and my wife and I help out. Through this process I was able to grab six boxes of books that were either too old or in too bad a condition to be sold, and therefore were destined for scrap. The books sat in my garage for a couple of months while I tried to come up with the idea. 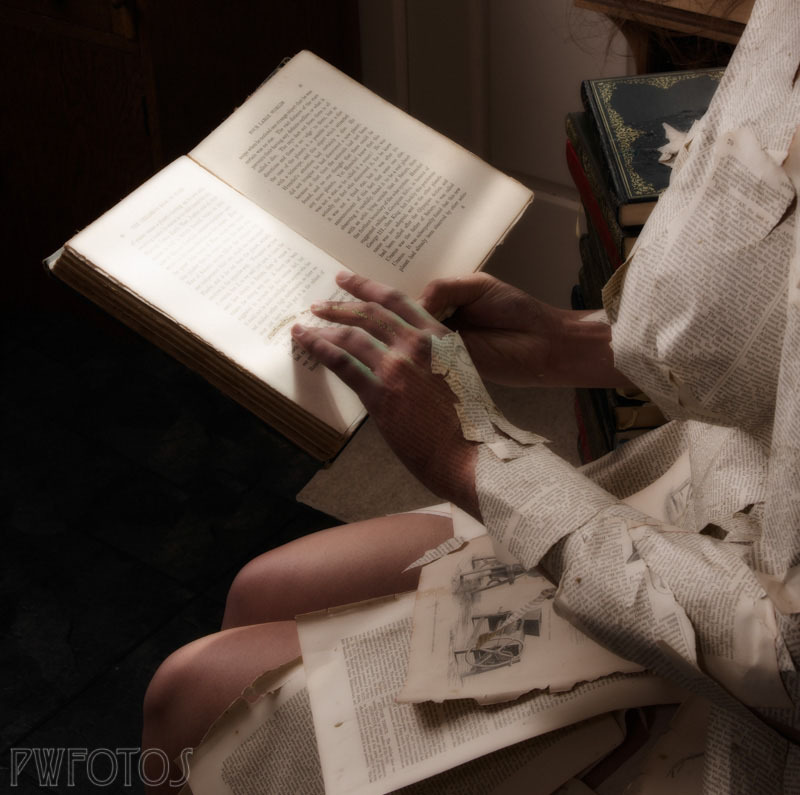 Eventually the concept emerged of a person who was so engrossed in the books that she became part of them. 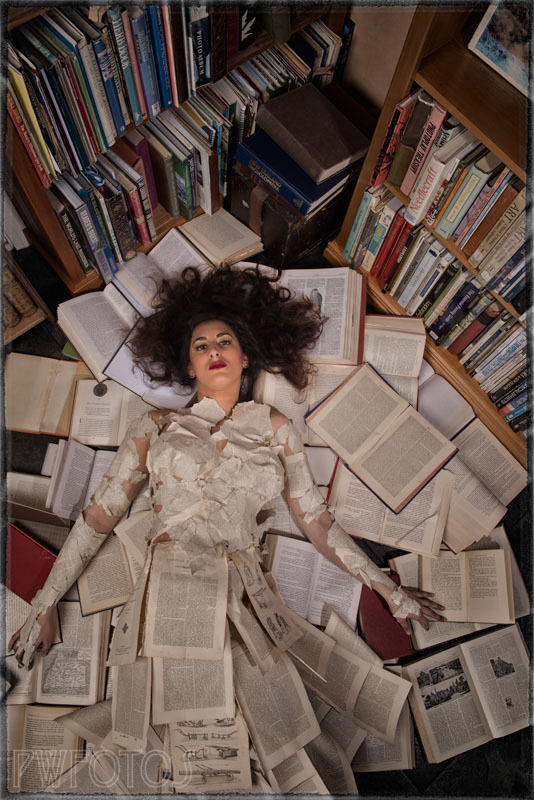 I had seen an image of a girl covered in print and so I showed it to Tiffany Williams who is a very talented makeup artist. Once she agreed to come on board we set a date and I cast for a model. My call was answered immediately by Grace who I have worked with on a number of occasion as a makeup artist but this was to be the first time as a model. I had initially envisaged that we would cover her whole body in the print but then decided that only her upper body was needed in this way and that I would make a skirt to cover the lower half. I made a simple skirt out of calico and then glued pages from an encyclopaedia to it. In order to create the look of a library I moved a bookcase into our entranceway so that it could line up with another one that we already had there. We made up a simple paste out of flour and warm water and Tiffany spent the best part of an hour gluing strips of paper to Grace. While she was doing this I built a throne out of the books and fashioned a crown. The images came out pretty much how I had envisaged them. In photoshop I fixed up and extended the backgrounds to come up with a selection that I really liked. A couple of them will now be entered into upcoming photographic competitions.